I was chuckling to myself as I drove up the M6, listening to Steve’s tale of woe from the previous weekend, but I should have known better. He’d gone to Linotype Cheadle Heath Nomads, based on an affirmative Tweet from the morning, but upon arrival he found the gates locked and no sign of life. A quick piece of investigation found that the game had actually been postponed due to waterlogged pitch, and despite an offer from the opponents, AFC Macclesfield, to switch the game, Linotype declined. All a bit strange, not suggesting any subterfuge going on but you do wonder if they were bodies short? Anyway, it turned out Steve didn’t just throw the toys out of the pram, he tipped the pram up and set it alight. He could have gone to nearby Stockport County, or any other club in the vicinity for that matter, but at that stage he’d given up on non-league football and had vowed to get a season ticket at Manchester City. He had calmed down by the time I spoke to him, and was putting it down to bad luck, but as I reminded him, at least once a season he has a moment like this. The last one resulted in a pledge to never watch a game of football ever again in certain specific leagues that at some point had annoyed him, but it soon passed. I was on my way to Lower Breck to watch them play Aigburth Peoples Hall, but as I pulled into a pub car park just over a mile from the ground, I made a cursory look at Twitter and spotted that Breck, who needed to win tonight to claim the Liverpool Premier League title, were being congratulated on winning the league? Turns out the game had been postponed twenty minutes earlier as the visitors couldn’t raise a side, and consequently the hosts had been awarded the points and by default, the title. Clearly not Lower Breck’s fault at all, and I’m sure they would have rather won it on the pitch, but I needed to plan and quickly. Clearly my amusement at Steve’s predicament had lead to some Karma being dumped on me from a great height, but as an alternative I had a choice of Winsford United v 1874 Northwich in the Mid-Cheshire Cup Semi-Final, or Sandbach United v FC Oswestry Town in the North West Counties League. Distance and time wise their wasn’t much in it, but I kept changing my mind as I travelled along the M62 and the M6. You see, the game at Winsford was a local derby at an old stadium, but as it was a cup tie it could go to extra-time and given 1874 are playing virtually every day, what sort of side would they field? Sandbach are looking to get a play-off spot in the NWCL, and the ground is more modern than the Barton Stadium, but what swung it for me was that I’d get home ever so slightly quicker, and, it was actually a game that in different guises was commonplace in the early 1970’s during the halcyon days of the Cheshire League. 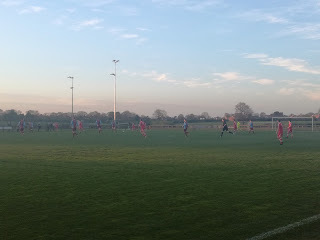 Sandbach Ramblers and Oswestry Town were both members of the aforementioned league, but both moved in very different directions. 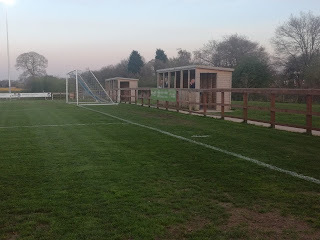 Oswestry made it to the Northern Premier League, but folded in 1988 and the ground became housing. 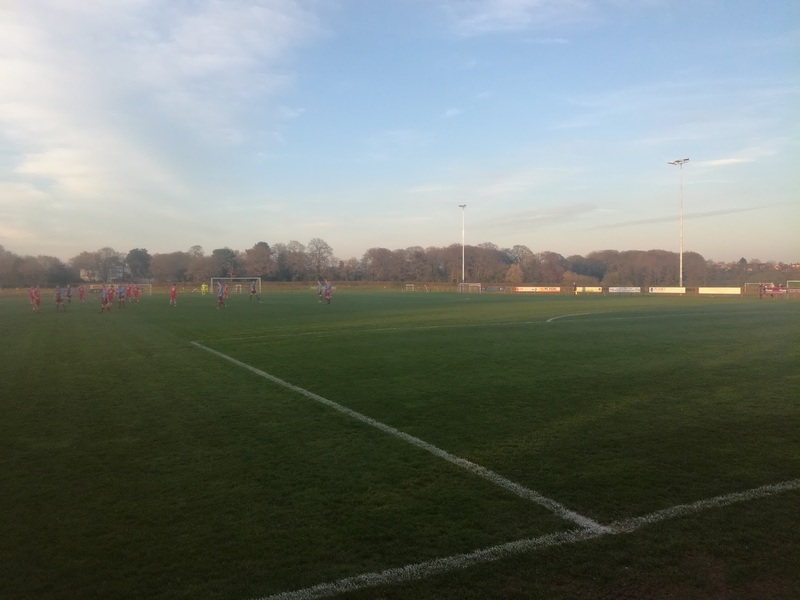 They then reformed a few years later playing out of the Park Stadium on the outskirts of town, starting in the Wrexham League before making it to the Cymru Alliance and eventually the Welsh Premier League. But, TNS came sniffing and in 2003 the two clubs merged to play out of Oswestry and name was gone again. 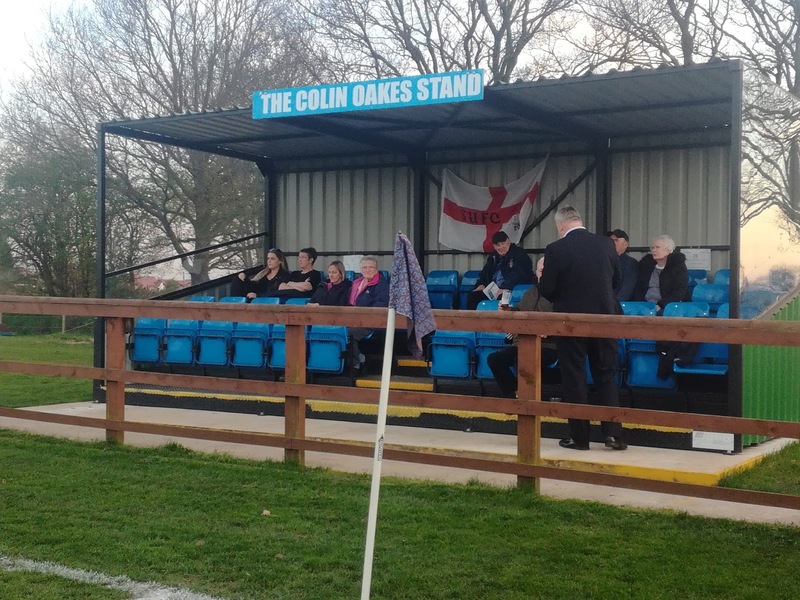 However, FC Oswestry Town appeared, playing in the local leagues initially, and then in 2016 they were admitted to the North West Counties League, ground sharing with TNS! The name Sandbach Ramblers is not unique, and by that I mean, it has been used by at least three different clubs. The original club folded in 1975, but a local club were renamed the same in 1979 before disappearing again in at some point in the mid-Eighties. A further club was formed in 1995, but again, they disappeared from the senior scene and continued to operate in junior circles until in 2004 when they merged with another local side, Sandbach Albion, to form the club we have today, Sandbach United. 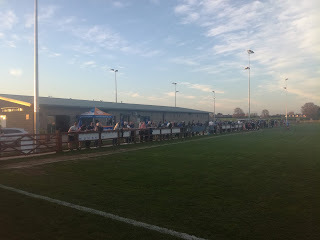 I made my one and only visit to Sandbach United in May 2016, they were a Cheshire Football League side who at the time were on course for promotion to the NWCFL. Ironically the opponents that day were Linotype Cheadle Heath Nomads, and it was a wet May Bank Holiday Monday. It was so wet, the game almost didn’t take place due to waterlogging, but it did, and what I found was a very friendly and progressive club. It was also a bit of a strange day that day because just prior to setting off I got a call to say my Grandmother had died, it was not a shock but it was sad all the same. Since my last visit some work has been done to the ground. 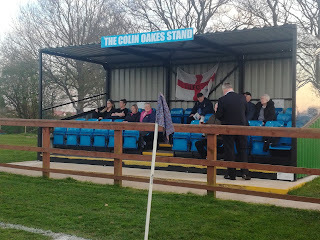 Floodlights have obviously been installed, while behind the goals where the two wooden ‘sheds’ are lovcated is now a small Atcost style seated stand. The clubhouse adorns one side of the ground, with the artificial pitch behind it, but otherwise it is an open arena, and part of a larger expanse used by the various teams under the clubs umbrella. 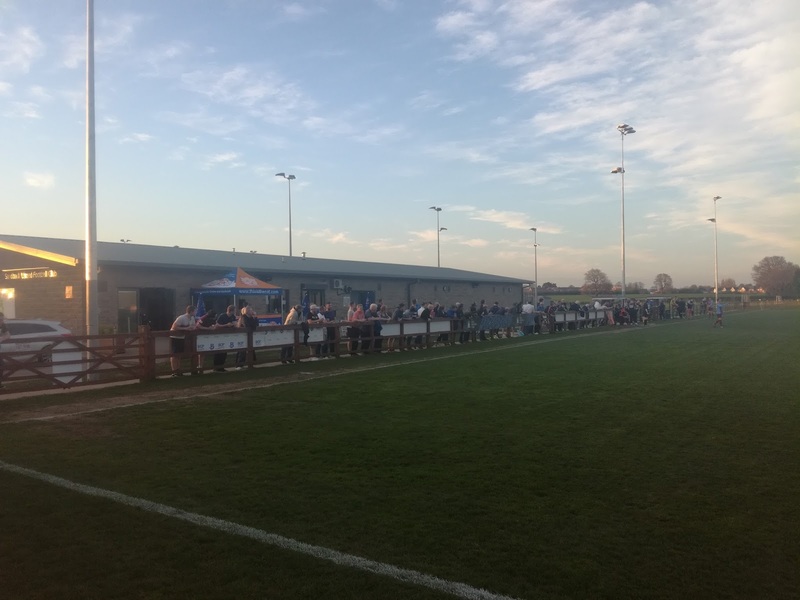 A very healthy crowd of 149 had turned up on a lovely evening and saw the hosts take the lead in the 14th minute via a great strike from Chris Smith. The first half was reasonably even, but once we moved into the second period, the hosts dominated completely. Ryan Allcock made it two just four minutes after the interval while Chris Jackson made it three just prior to the hour mark. 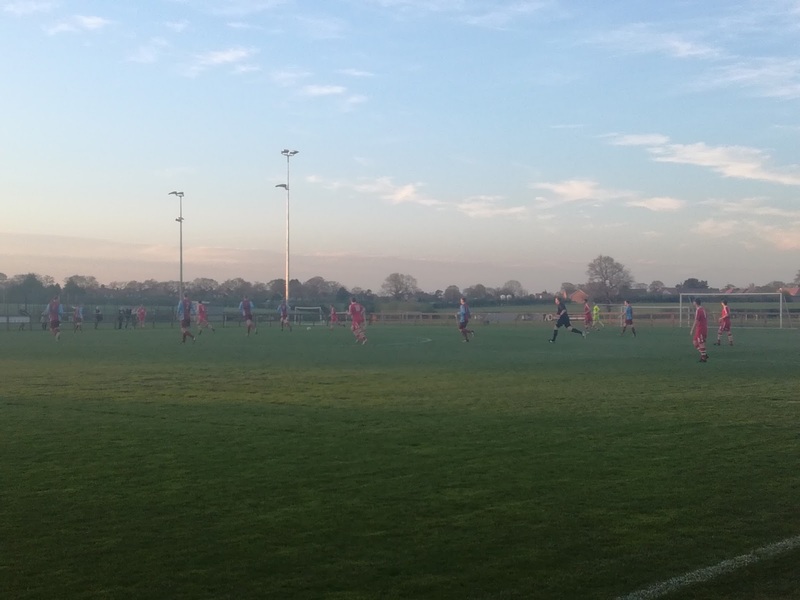 The fourth goal from James Kirby arrived in the 75th minute, and the result saw Sandbach further cement a place in the zone for the end of season lottery. Not my first choice of venue, obviously, but a very good night all the same. I exchanged a bit of banter with Lower Breck via Twitter, extolling the virtues of what a lovely place Sandbach is when the sun’s out. The fella who runs the account for Breck was also looking forward to a visit to Sandbach next season, promotions etc permitting, claiming his only ever visit was to the service station for fuel! Lower Breck will have to wait until next season now, but as Plan B’s go, this was a very satisfactory recovery job at a very good football club.